Not to be confused with Indian pariah dog. In ecology, the term pariah dog refers to free-ranging dogs that occupy an ecological niche based on waste from human settlements. When used in this manner, the term describes a large percentage of dogs worldwide, especially in developing countries, Eastern Europe and the Balkans. While most pariah dogs are free-ranging, not all free-ranging dogs are genetically pariah dogs. Though they are "outcasts" in the social sense, and thus may still be called pariahs by observers who are not cynologists, feral dogs may be of any or mixed breeds. Individual dogs may be stray pets, descended from strays, or from litters abandoned by owners. They may live in packs, pairs, or singly. All authentic strains of pariah dogs are at risk of losing their genetic uniqueness by interbreeding with purebred and mixed-breed strays. To prevent this from happening, some strains of pariah dogs are becoming formally recognized, registered, and pedigreed as breeds in order to preserve the pure type. The United Kennel Club (United States) recognizes purebred dogs bred for chasing large game in the Sighthound & Pariah Group. Included in this group are breeds that are either of early origin or modern reconstructions of early breeds or types. The group includes the Afghan Hound, Azawakh, Basenji, Borzoi, Canaan Dog, Carolina Dog, Chart Polski (Polish Greyhound), Cirneco dell'Etna, Greyhound, Hungarian Greyhound, Ibizan Hound, Irish Wolfhound, New Guinea Singing Dog, Pharaoh Hound, Portuguese Podengo, Rhodesian Ridgeback, Saluki, Scottish Deerhound, Sinhala Hound, Silken Windhound, Sloughi, Spanish Greyhound, Thai Ridgeback, Whippet, and Xoloitzcuintli. In place of "pariah", which is derived from the Tamil word paraiyar and was first used in English in 1613 referring to a lower class within the traditional Indian caste system or "social outcasts", most registries other than United Kennel Club use the term "primitive". Primitive in the sense of "relating to an earliest or original stage or state" or "being little evolved from an early ancestral type" to refer to pariah-type dogs. The Fédération Cynologique Internationale, for example, places its pariah-type dogs within a breed group designated "Spitz and Primitive." The Carolina Dog, found in the southeastern United States of America, is one example of a pariah-type feral dog. The Carolina Dog closely resembles feral dogs found in deserts of middle eastern countries. Both the desert dog (known as the Canaan Dog) and Carolina Dog are recognized as purebred by the American Kennel Club. 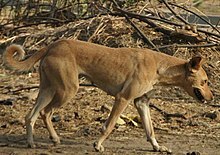 Indian pariah dogs are typically medium-sized and have yellow to rust-colored coats. ^ United Kennel Club. "United Kennel Club: Breed information". Archived from the original on 2011-01-03. Retrieved 2008-04-22. ^ "pariah - definition of pariah". TheFreeDictionary. Retrieved 2008-04-26. ^ The American Heritage Dictionary of the English Language, 4th edition. "primitive: Definition, Synonyms, More". Dictionary. Houghton Mifflin Company. Retrieved 2008-04-26. adj. Not derived from something else; primary or basic. Of or relating to an earliest or original stage or state; primeval. Being little evolved from an early ancestral type. ^ "Breeds nomenclature" (in English, French, and German). Fédération Cynologique Internationale. Retrieved 22 August 2012. ^ Club, American Kennel. "Carolina Dog". American Kennel Club. Retrieved 2017-11-25.